Service Provider of a wide range of services which include reflective road stud, road stud and solar road studs. The cat's eye is a retroreflective safety device used in marking. The road stud reflectors are extremely durables devices providing day and night visibility in adverse weather conditions. These are reflectorized, i.e. reflect light from vehicle’s headlights back to drivers eye. These provide a definitive and clear, outline of pavement markings during poor visibility conditions like darkness. 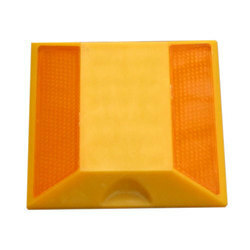 Serving our clients in the past numerous years, we have gained experience in manufacturing high-quality road safety equipment like plastic Road Stud. 1) Active emission of solar road studs can not only prevent mist interference in the largest extent, but get rid of the dependence of the drivers on car lights with farther and better visual distance. 2)The solar road stud of NK-RS-A6-1 is a new design and patent product of NOKIN TRAFFIC FACILITY. 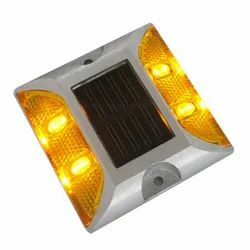 It can stand the pressure of 30 tons so that cars can drive on the solar led marker light directly.